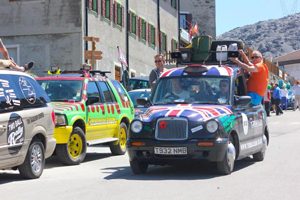 After a 1200-mile trip around Europe in an old London taxi, the Terraclean on Tour team came out on top in the Two Ball Rally, raising £5000 for Macmillan Cancer Support in the process. The team of six, consisting of Phillip Dowd and Chris Simblet of Randstad, Chris Warren of Tuna Garage, John Bowen of JB Motor Repairs, Gary Wood of the Diesel Doctor and Andy McClurg of Clurgy Services, were tasked with four days to travel from the UK to Nice. Their adventure, sponsored by NGK, Philips, Launch UK, Signs Express, DPT and Classic-Pro among others, saw the team tackle a challenging route spanning across seven countries including, France, Belgium, Italy, Germany and Austria, before arriving in the Mediterranean town of Nice, all in a Hackney Carriage with more than 500,000 miles on the clock. The charity road trip, which began on August 14, saw the team also needing to complete various tasks along the way to finish first. They included buying certain souvenirs, gatecrashing a wedding and a hen party, and having a photo taken outside the famous Casino Monte Carlo. Dowd said: “It was one hell of a journey and experience driving 1200 miles in an old Hackney Cab that had 500,000 miles on the clock, a failed head gasket and had to be refilled with water every 50 miles. “But we kept battling on and ‘Maggie’ – the nickname we gave to our taxi – got us to the finish and all the way home again. It was a remarkable feat and we’re all thrilled that we were able to raise such a healthy amount for Macmillan. To donate towards the Terraclean on Tour team’s total, either can be made at www.justgiving.com/terracleanontour or by texting TERA69 and an amount to 70070.